How do items get to move from the one list to the other? (note: everyone has their own two lists, and each item moves at different times for different folks). How do your two lists look, at the moment? Looking at this another way, the obviously wrong list above has items that, although once not obviously wrong, now appear on many folks’ obviously wrong list, having made the transition through e.g. a process of reflection, evaluation, discussion and above all UNLEARNING. FWIW, it occurs to me that we might choose to regard the raft of #No… hashtags on Twitter as opportunities to consider in which of our own – and others’ – lists the related (hashtagged) topic appears. The word “development” in the phrase “business development” has always meant something very different than in the phrases “product development” or “software development”. The term “business development” is generally taken to mean finding new customers, building customer relationships, and such like. And thus responsibility primarily resides in the Sales & Marketing silo. Maybe this is one reason why the idea of “developing” a business, in the same sense as developing a product or a software system, is pretty much unknown to business folks. Many’s the time I have invited business folks to consider the merits of taking a “development”approach to the construction and evolution of their business, only to receive little response other than a sea of blank faces. Which makes me sad, because there’s an enormous amount of “development” practice, expertise and skills available to apply to the challenges of developing a business or other organisation. I’d say that some 80% of the know-how involved in developing products or software systems is directly applicable to “developing” an organisation. Have you ever suggested to business folks that “development” know-how could have a massive impact on their bottom line? Or otherwise effectively meet many if not all of their core needs? What kind of reactions have you seen? I accept it’s a statement open to interpretations other than the one I have in my head. And maybe that ambiguity is a positive, in any case. To clarify, I love to be involved with communities of people, contributing to what’s alive in those communities and in the people that make them up. I find joy in making and sharing relationships. And in attending to the needs of others. And some joy when that’s reciprocated, too. I choose to call the nature of my involvements “play”. I accept the risk that some might choose to regard this as frivolous. I’d very much like to rehabilitate the idea of play as something positive, weighty and valuable. And what are volunteers but folks who want to play at what they’ve volunteered for? In practice, playing with organisations, for me, means getting involved with people as they work – or better, play – each day. Listening to how they feel and what they guess they and their communities might need. Playing together with them to see and explore together how their individual needs dovetail into the needs of the communities in which they live, work, and play. And asking the odd (sic) question here and there to invite folks to consider if their current assumptions and modes of working/playing/living best suit their needs, or if there may be other ways, more effective ways, to do that. 1. Don’t Talk About Agile. 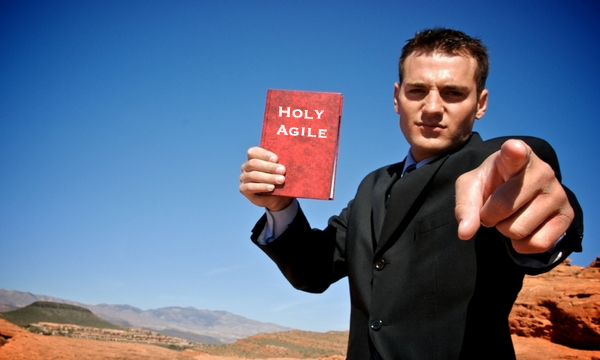 The first rule of evangelising Agile is: You do NOT talk about Agile. The only folks who want to hear the word – or the gory details – will be those who are looking for a badge of some kind. Or for bragging rights at the golf club. Or tyre-kickers. Strong prospects will not be interested in the label, or the details, but rather in the fact that you understand and care about their problems (empathy) and have useful – and proven – solutions for them to apply. Some of these useful solutions may involve Agile things. Shhh. For example: Talk about their business issues, and the issues common to their business domain. Telcos might be interested in better customer service, and better customer experiences when using their online services, apps, etc..
Plant your cause’s seeds in fertile minds. With folks that are ready or at least willing to listen. If they think they know what their problems are, and that their existing strategies are good for addressing those problems, don’t waste your – or their – time. There will be a few folks who are either unaware of their problems – these may listen, or aware but dissatisfied with their current strategies (solutions). For example: Engage with new prospects, equipped with a checklist of those things that you believe signify fertile soils. Make it an early priority to gather the information needed to complete the checklist. If a new prospect rates poorly on the checklist, decline their kind offer to take things further. Make your cause relevant and specific to individuals and their existing needs. Help them see how your cause is a more effective strategy for them than their existing ways of working, and thinking. Of course, to connect with folks’ needs, you’ll have to attend to (explore) those needs. For example: Ask your contacts in the organisation what they need. Enquire as to whether there might be others they could suggest with whom you might have similar conversations. Discuss how new ways of working might address some of their needs, individually and collectively. Many folks need help in acquiring a suitable metastrategy or two before they can move on from their existing strategies and adopt the one(s) you are proposing. In many sales situations, standard advice is to avoid talking about the negatives. In Agile adoptions, avoiding mention of the pitfalls only sets up the client for failure. As DeMarco and Lister said in Waltzing With Bears “Risk Management is Project Management for grown-ups”. Maybe your audience has few to no adults? Then RUN! For example: Talk about the rates of failure (generally estimated at somewhere between 50% and 95%). Talk about the common failure modes (faux agile, management discomfort and resistance, change fatigue, organisational cognitive dissonance, etc.). And talk about some possible mitigations for those common modes. What are the benefits? Not the old chestnuts of “faster, cheaper, quicker”. But benefits that directly address their own particular specific pain point(s). For example: “I understand your biggest competitor can add major new features to their flagship product in six weeks or less. With the necessary changes, we believe that your team could do the same, in timescales as short as two weeks.” In my post “Pitching Agile” I describe using The Three Box Monty as a sales tool in “selling agile” to executives. The Kanban Method, for example, cunningly says “start where you are”. Although this begs the question – where else could one start? In any case, engage the prospective client in discussing options and help them come up with their own way forward. For example: Visualisation (of a part of the current workflow) or explicitly limiting work-in-progress (recognising current implicit limits) might be places to start. Rah-rah motivational speeches and miraculous stories are best left for the God Squad. They have an audience that responds to that kind of thing. Use empathy rather that motivation. Wow. Really? Not “appear well-organised” But actually be well-organised. For example: Have standard templates, checklists, and other documents and planning tools ready and to hand for each new prospect. Keep track of contacts, needs, dates, conversations, and so on. Again, clients and prospects can tell when you’re organised. Don’t proselytise dogma. Don’t make grandiose claims. Don’t make any claims at all. Not even when you have ironclad evidence. Evidence rarely sways anyone. Great evangelists connect with people, and their existing needs. If what you’re selling isn’t what they need, then smile, wish them well, and move on. These are all post-hoc rationalisations of one basic truth: The Snowbird folks and their fans – then and now – were fed up with wasting their lives on failed and “challenged” software projects, on make-do-and-mend development, and wanted to do something about the quality of their lives at work. Theirs, and their peers. They felt a need to make more of a difference to the world than then-current software development approaches allowed. Put another way, their championing of the agile cause was a means for developers everywhere to – rather unilaterally – attend to their own needs, including more closely living their (Theory-Y) values. Sadly, lacking a whole-system, all-stakeholder, organisational-dynamics perspective, the result was a somewhat parochial thing. A thing that failed to recognise that software and its development rarely exists in isolation, and much more often happens in a context largely outside the control of those folks directly engaged in writing the software. Now, some fifteen years on, we can see that the insanity – and tragedy – of agile – lies in the Sisyphean task of trying to build effective teams – and ways of working- inside ineffective organisations.